High expectations notwithstanding, I was pleasantly surprised by this issue. Ever since the Ultimate Spider-man video game and artist Stuart Immonem replaced original penciller Mark Bagley, I have loved the Brian Michael Bendis written alternate take on the friendly neighborhood Spider-man. While staying true to the core of the character comic readers have loved for more than fifty years, the ultimized version of the wall crawler has been redefined for a new generation with original takes on both characters and stories. Originally there were a lot of references to the original continuity, lately however the whole Ultimate universe has gone topsy-turvy and has never been more unlike the original Marvel universe. The pinnacle of this new direction perhaps being the recent death of Peter Parker and the announcement that he is being succeeded by African American/Latino youth Miles Morales. Just as the first start of Ultimate Spider-man back in 2000 the story that is being told is super decompressed. Originally we didn’t get to see Peter Parker in costume until the sixth (?) issue. If the first issue two issues of this series are an indication it looks like Bendis is taking his time again, this time around. So while this may not be for everyone and might read better in a collected edition, it works completely that this series as of yet is pretty low on action, while it’s packed to the brim with emotional punches and funny bits. As to what happens in this issue, we see Miles panicking about the fact that the bite of an irradiated spider has given him some mysterious superhuman abilities (not all like the original Spidey). In his panic, he visits his friend Ganke to demonstrate what’s happening to him and voice his fears of turning out to be a mutant. In doing so, he accidently discovers yet another new ability. Later we see an important moment of bonding between Miles and his father about the (criminal) history his father and uncle share. 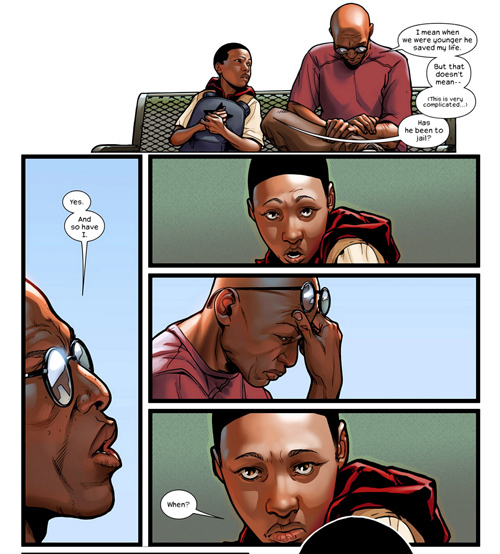 Finally, we see Miles getting text messages from Ganke explaining that just like the original Spidey he isn’t a mutant but has somehow gained the abilities from the bite of a spider (which I guess is the first thing actually steering him to becoming the next Spidey). So while the story is as good as it gets, the art by Italian penciller Sarah Pichelli may be even better. Seriously, this book looks so good it made me weep. Reading this issue and taking in the gorgeous artwork was a miraculous experience that made my eyes bleed in a good way (the best way). If it was possible in some shape, way or form I’d marry this artwork (I think it’s slightly more realistic my wife would share me with artwork than with the artist). Effective linework, dramatic camera angles, dynamic action, really Marvel should count their blessing that she wants to work for them. I especially admire Pichelli’s ability to render every character through very unique and realistic body types and postures. 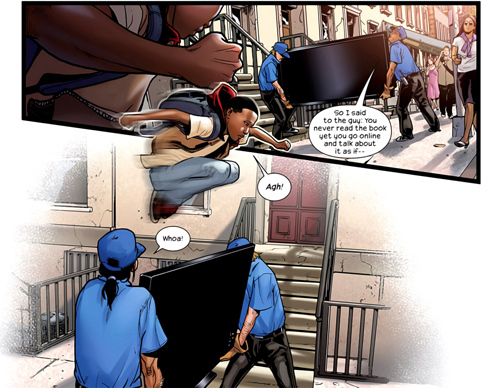 Whether it’s the young Miles (the slimmest and scrawniest Spider-man ever? 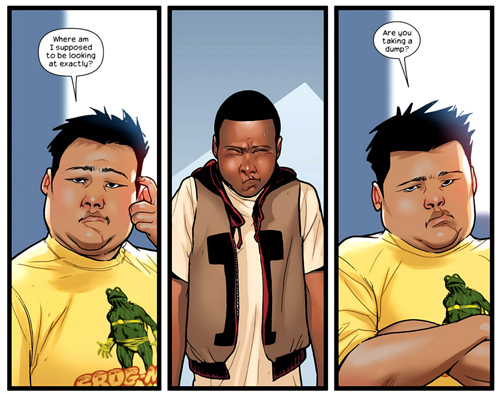 ), his geeky and slightly obese Asian friend Ganke, or Miles’ father with his stern expression, freckled face and bald head they are all very realistically, fully developed , three dimensional characters. And honestly I can’t wait to see Miles in his costume, because he is the youngest and smallest Spider-man we’ve ever seen and I have always liked the fact that the first Ultimate Spider-man was always portrayed as a slimmer and shorter version. And no doubt Pichelli will be able to use Miles diminutive dimension to great effect in action scenes. 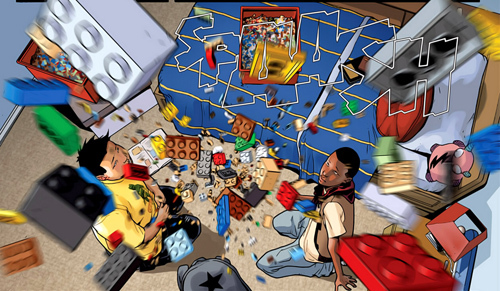 Overall, this issue offers tons of beautifully drawn and well written character development. Additionally, we get a first peek of Miles his new and mysterious powers and the supporting cast is slowly being expanded, with perfectly fleshed out human beings, as we have become to expect from Brian Michael Bendis’ last 160 issues of Ultimate Spider-man. 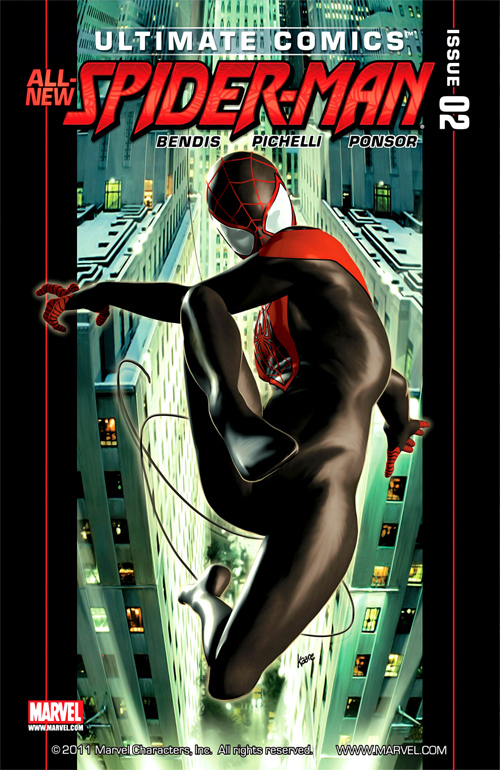 This entry was posted in Book of the week and tagged Brian Michael Bendis, Comic book review, Marvel Comics, Miles Morales, Sarah Pichelli, ultimate Spider-man. Bookmark the permalink.